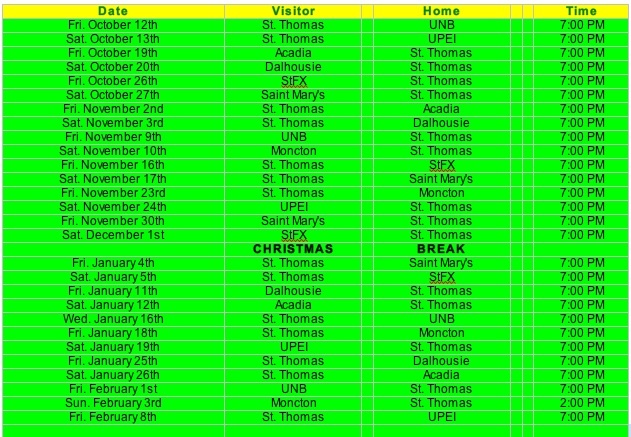 The Tommies will open the new season on the road in Squirrel land facing UNB down the hill on Oct. 12th, while the new Grant*Harvey Centre home opener will be the following week hosting Acadia on Oct. 19th. The annual Lou Chabot Memorial game will be played Friday February 1st. The regular season wraps up on the road at UPEI Feb. 8th. The schedule is a tad wonky this year with 16 games (including 9 home games) in the first half and 12 games in the second half. This was probably in preparation for the World University games that were to be played early in 2013 but have been pushed forward to December of 2013. Both the quarter-finals and finals in the AUS this year are Best 2-of-3 with the semi-finals a Best 3-of-5. The CIS championship will be in Saskatoon, Saskatchewan and the two AUS finalists will earn a berth.